From the minds of iconoclast writer/director SUDA51 (Goichi Suda) and legendary directors Hiroyuki Kobayashi and Shinji Mikami, killer7 returns for the first time in over 13 years! From the renowned studio Grasshopper Manufacture, Ltd. comes a cult classic adventure game that cemented the studio's international fame and recognition. Dive into a dark world of underground assassins in a tale of revenge as Harman Smith, a man who manifests 7 deadly personalities into the real world, known as the killer7. Take control of this distinct murderers' row as they hunt down the sinister Kun Lan, to stop his plan of world dominance, and end his organization of deadly suicide bombers known as "Heaven Smile." Multiple Personalities - Take control of Harman's distinct 7 personalities, each with their own appearance, personality, weapon of choice and special ability. A Sinister Foe - Face off against the "Heaven Smile" organization in a unique combination of first and third-person shooting mechanics. 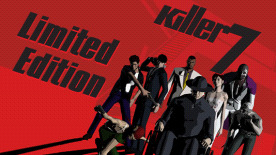 Killer Moves - Utilize the full host of killer7's special abilities to reveal secrets and solve puzzles. Your Pick - Switch between personalities at will to best tackle every encounter. A Dark Path Awaits - Follow a deeply engaging storyline brought to you by one of the highly acclaimed creators of all time, SUDA51. A New Look - Optimized for PC, now experience the cult classic like it never has before!